Make sure you put Wednesday 2 August 2017 in your diary. 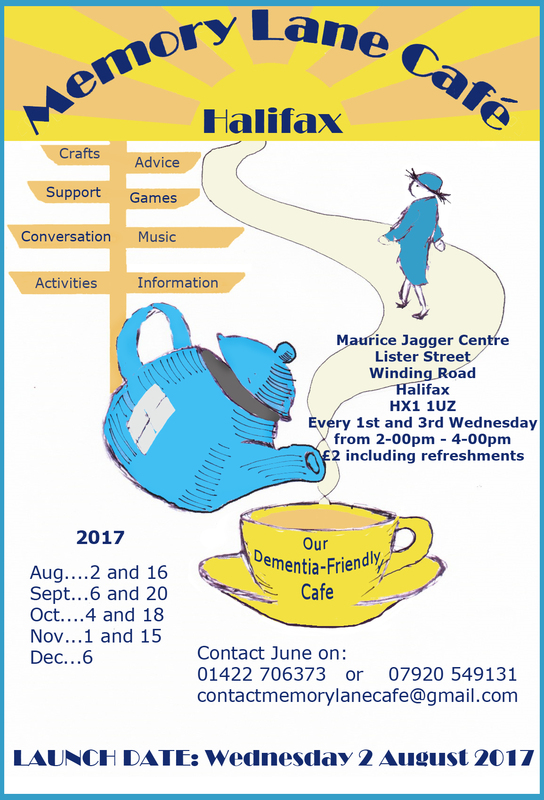 That’s the launch date for the Memory Lane Cafe at the Maurice Jagger Centre, Lister Street, Winding Road Halifax. The cafe will be open on the 1st and 3rd Wednesday of each month 2pm to 4pm and for £2 there are refreshments as well as crafts and activities, music and games and just general conversation. Sometimes you just want a brew and something to do. A copy of the poster to display in your premises can be downloaded from Memory Lane Cafe Halifax 2017. We don’t actually run the café but if you want to get in touch with Julie on contactmemorylanecafe@gmail.com I’m sure that she could use some help. If you wish, you could also ring her on 01422 706373 or 07920 549131.
its chantelle burton and I am just emailing you to ask if you need any help on the following days above. if so I will be pleased to help and I can whenever as I have left school now.